Transaction and Cash Box Drawer are for drive-in or walk-up business that allows the clerk to maintain customer contact while safely secure inside. The customer's view of cash drawer contents is blocked by a hinged locking cover. The Clerk can pass small packages by removing the deal tray if desired . The operating handle uses a self-contained locking device. This unit has built in slots for credit card receipts. Constructed of stainless steel. Deep Transaction Drawer with Cash Tray will serve walk-up business, protect employees and inventory while allowing transfer of cash, credit cards or small products. Unique design will enable the transfer of motor oil, six-packs of beverages, and other bulk products. All these functions are built into one compact unit engineered for security and ease of operation. Self-contained, smooth operating locking mechanism requiring no keys. This model also has 10 gauge steel bullet resistant liners in front and back. Two attachable purse shelves are included with the unit. Sliding Deal Tray and Pass-Thru Drawer handles two jobs using one unit. The sliding lid has a built in deal tray for transferring cash and small items by sliding the lid forward and back. Bulk items can be passed through the larger cavity below. The five inch (127 millimeter) wide cross member on the top of the unit allows for through wall installations, or the unit can be mounted on a counter top with the window notched around it. Our counter mounted Large Capacity Counter Mount Transaction Drawers are ideal for drive-up and walk-up service. A Lexan lid allows clear view of contents while protecting direct entry of outside air. Stainless steel front panel of unit pivots up as drawer is extended. Drawer is weather-resistant. Push button latch keeps drawer lids locked when closed. 14"5/8 " DEEP 17"1/4" WIDE X 27"
The Oversized Transaction Drawer is perfect for convenience stores and is ideal to transfer a gallon of milk or two liter bottles of soda. 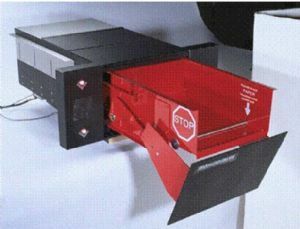 Standard Large Capacity and Oversized Transaction Drawers offer both Counter Mounted and Thru-Wall models. Stainless Steel Deal Drawer is built to be recessed in the counter top along the front edge to achieve a flush appearance. Glazing above the flat hood portion provides a barrier that doesn't obstruct operation of drawer. A full width handle across the rear of the drawer pushes it smoothly along ball bearing glides for easy operation. Lexan lid will not open when drawer is extended. Drawer unit has stainless steel construction. Complete unit is fully assembled and ready for installation. will serve walk-up business, protect employees and inventory while allowing transfer of cash, credit cards or small products. Unique design will enable the transfer of motor oil, six-packs of beverages, and other bulk products. All these functions are built into one compact unit engineered for security and ease of operation. Self-contained, smooth operating locking mechanism requiring no keys. This model also has 10 gauge steel bullet resistant liners in front and back. Two attachable purse shelves are included with the unit. This drawer like the powered model is constructed of high tech machined components and designed for the rigors of a drive-thru environment. The drawer was built to provide the maximum in customer and employee conveniences. The drawer�s design allows for easy operation using a 2 to 1 movement ratio. For every one inch of force applied to the handle the drawer moves two inches. An additional operator convenience is the use of compression seals, versus brushes, around the exterior door and a slide door around the handle preventing outside air from entering when the inside door is open and the handle is being moved. Customers can access the drawer either from the top, in taller vehicles, or from the front. This drawers large transaction hold down bar is also a plus preventing currency and paper transactions from blowing away. The outer shell of this drawer is 11ga. cold finished steel and the drawer bin is .050� aluminum. 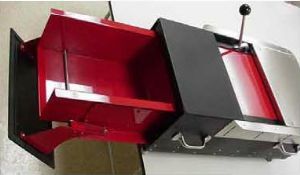 The .080� aluminum door drops down and toward the building reducing the chance of the operator hitting a vehicle. The bin size is 16� deep x 11� wide x 6-1/4� tall with a maximum extension of 15�. The Manual Transaction Drawer comes with a one year limited parts warranty and can be shipped overnight via UPS if an emergency requires it. The normal lead-time on this drawer is 2 weeks. The fully powered Transaction Drawer� is very different from other drawers. This drawer does not use gears, pulley or cables like most others. It uses a twin lead ball screw rod assembly which enables it to extend farther (18 inches), carry heavier (25 lbs.) and larger items (16�x12 ��x5 ��) than most other drawers. The transaction is easier for the customer because you can get the drawer closer to the vehicle reducing the chance of them mishandling materials. The drawer uses flat compression seals, versus brushes, which increases the ergonomics of the work area by reducing noise while preventing cold air and contaminants from entering the building. The Transaction Drawer also includes an electronic brake. The brake stops the drawer immediately preventing any coasting which occurs with other drawers, resulting in damage to customer vehicles. This drawers large transaction hold down bar is also a plus preventing paper transactions from blowing away. The drawer was designed for use with new or retrofit construction. This is a UL Listed and Classified product. is the economical security solution for cashier windows, ticket windows, outdoor ticket and payment kiosks and other high-risk areas. Suitable for walk-up or drive-thru applications in interior and exterior environments, the 672350 features an extending tray housing and a removable deal tray for installation in countertops with a window above, in kiosks or through other window arrangements. The face of the extending tray is equipped with an UL� Level 3 bullet resistant insert for additional security in the closed position. is designed to maximize operator security in adverse environments such as access control kiosks, drive-thru banking, detention centers, fast food restaurants and convenience stores. An interlocking lid cover prevents direct physical contact between the operator and customer. The faceplate is constructed of brushed stainless steel and reinforced with bullet resistant UL� Level 3 material. The manually controlled transaction-locking mechanism prevents unauthorized access and the drop door construction requires minimal space for access to the transfer area during vehicle transactions. for transferring items to and from the operator without opening doors. Use these dual action pass-thru drawers for small transactions (i.e. money, credit cards) or remove the deal tray and pass large items. Model 670330 has a built-in speaker, which attaches to existing intercom systems. Model 670331 has the built-in speaker and its own stand-alone intercom system standard. All units are finished in brushed stainless steel. Use the built-in sliding deal tray for passing small product transactions (i.e. money, credit cards). Unlock the deal-tray to reveal the bulk transfer area below. Optional Weather Guard frame keeps wind and weather from the buildings interior. All units are finished in brushed stainless steel and shipped assembled.